Dog training–1700s to 2036 and beyond? Dog Training Has a Deep History–What’s Next? 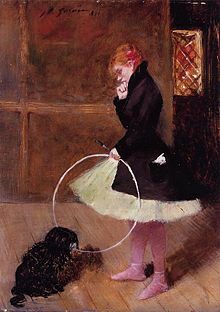 Thanks to Terrierman's Daily Dose for the extensive insight to dog training and its evolution. Read to the end, and you may change your mind about considering dog trainer as a lifetime occupation. If nothing else you can expect a smile from the comment left. In all seriousness, there are many aha moments that make this post worth sharing by including it in our careers category. 1700s: Truffle hunters learn to give their dogs bread when they locate truffles, which turns out to be cheaper than using pigs which cannot be stopped from eating all the truffles they locate.1885: S.T. Hammond, a writer for Forest and Stream magazine advocates in his columns and in a book entitled Practical Training, that dogs should be praised and rewarded with meat when they do something right. 1880s: Montague Stevens trains his New Mexico bear dogs by rewarding them with pieces of bread instead of beating and kicking them as others of that era were generally doing. Stevens is a famous bear hunter and friend of Teddy Roosevelt and the sculptor Frederic Remington. 1886: Edward Thorndike develops a theory of learning based on stimulus and response. Thorndike shows that “practice makes perfect” and that if reinforced with positive rewards, animals can learn quickly. 1898: Nikola Tesla invents the first radio-controlled remote control. 1899: The first canine school for police dogs is started in Ghent, Belgium using Belgian Shepherds, which had recently been established as a breed. 1903: Ivan Pavlov publishes his experiments with dogs and digestion, noting that animals can be trained to have a physical response to stimuli. Pavlov called this learning process “conditioning,” and in 1904 he was awarded the Nobel Prize for his research. 1903: The Germans begin schutzhund work, a competition devoted to obedience, protection, tracking and attack work.1907: Police begin patrolling New York City and South Orange, New Jersey with Belgian Shepherds and newly reconstructed Irish wolfhounds. 1915: Baltimore police begin using Airedales from England to patrol the streets. The police suspend use of Airedales in 1917 as the dogs had helped make no arrests. 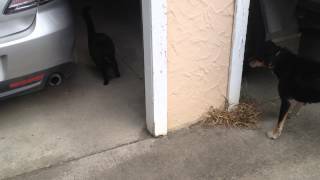 The police failed to notice that no robberies had occurred where the dogs were on patrol. 1915: Edwin Richardson trains dogs for the military during WWI using some positive reinforcement, and the dogs prove to be quick studies. Many dogs are used for communication and for guard duty. 1917: The Germans begin to formally use dogs to guide soldiers blinded in mustard gas attacks. The French soon follow suit. 1918: U.S. Army Corporal Lee Duncans find an abandoned war dog station in Lorraine, France which has five young puppies in a kennel. Duncan takes one of the pups and names it “Rin Tin Tin” after the finger dolls that French children were giving to the soldiers at the time. The dog travels to California, proves easily trainable, and is soon employed making movies that are so successful it saves Warner Brothers studio from bankruptcy. The dog dies in 1932 in neighbor Jean Harlowe's arms, and is buried in Paris, but its descendents work in the movies throughout the 1950s, inspiring many people to try to train their own dogs to do simple tricks. 1925: One of the very first German-trained guide dogs for the blind is given to Helen Keller. 1926: Propelled in large part by the popularity of Rin Tin Tin, the German Shepherd population in the U.S. explodes, and by 1926 it accounts for 36 percent of all the dogs in the AKC — 21,659 animals. Due to rapid inbreeding and poor selection, however, the American German shepherd quickly degenerates and is soon deemed inferior. 1929: Dorothy Harrison Eustis establishes the Seeing Eye Foundation to train guide dogs for the blind. Eustis goes to Switzerland to get a better stock of German Shepherds than she can find in America. This same year the AKC tries to ban the importation of foreign purebred dogs in order to protect domestic dog breeders, but the plan fails. 1930: About 400 dogs are employed as actors in Hollywood, the majority of them mongrel terriers which prove to be small enough for indoor scenes, rugged enough for outdoor scenes, and exceedingly smart. 1938: B.F. Skinner begins research into operant conditioning as a scientifically-based learning model for animals and humans. His special focus is on teaching pigeons. 1939: The AKC begins obedience competitions designed by Helen Whitehouse Walker who wants to prove that her standard poodles can do something other than eat food. 1942: The U.S. military says it needs 125,000 dogs for the war, and asks people to donate their large breeds. The military manages to train only 19,000 dogs between 1942 and 1945. The Germans reportedly had 200,000 dogs in service. 1943: In 1943, Marion Breland and her husband Keller Breland form a company called Animal Behavior Enterprises (ABE) to teach animals for shows. The Brelands had been students of B.F. Skinner (see 1938) and began teaching animals to perform tricks for shows and for commercial clients such as dog-food maker General Mills. 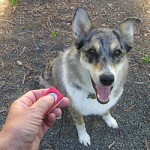 They pioneer the use of a “clicker” to teach animals at a distance and to improve timing for affirmations and delayed rewards. The Brelands were the first people in the world to train dolphins and birds using operant conditioning. 1943: The movie “Lassie Comes Home” is filmed, featuring a purebred male collie playing the female staring role. Ironically, the U.S. military considered purebred (i.e., AKC ) collies so stupid that they were specifically excluded from military service in World War II, while herding farm collies were actively recruited. 1953: Austrian animal behaviorist Konrad Lorenz writes “Man Bites Dog” and “King Solomon's Ring,” books which popularize animal behaviorism. 1954: Baltimore reestablishes its police dog program, and today it remains the oldest police K-9 program in the country. 1960s: During the early part of the 1960s, Marian and Keller Breland (see 1943) are hired by the U.S. Navy to teach other animal trainers how to train dolphins. The Navy is interested in using dolphins to patrol harbors, retrieve lost gear, and guide bombs (i.e. “suicide bomber” dolphins). During their work with the Navy, the Breland's meet Bob Bailey, the Navy's first director of animal training, and they began a partnership with him. Keller Breland dies in 1965, and in 1976 Marian and Bob Bailey are married. 1962: William Koehler publishes “The Koehler Method of Dog Training” which becomes a staple of AKC obedience competitors. 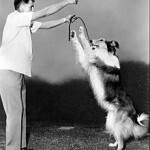 Though often criticized today, Koehler's methods are the core of a lot of effective dog training systems still in use. 1968: Sensitronix, Tri-trinox and Jetco come out with electronic collars for hunters. These are not dog training tools, but high-powered shock collars designed to bust dogs off of “trash” chasing of unwanted game, cars, and bicycles. The collars have one switch, and voltage is adjusted by changing out the “cartridge,” i.e. the capacitor inside the collar. 1970s: The U.S. Customs Service begins to use dogs to detect drugs, and they are subsequently employed to sniff out explosives and fire-starting chemicals. 1971-72: Richard Peck, a traveling salesman in Pennsylvania, develops a pet containment system which is a cigarette pack-sized receiver that fits on a collar with electronic prongs touching the animal's skin. The battery in the collar charges a capacitor which discharges when triggered by a radio signal coming from a perimeter wire. Manufactured by the Sta-Put Sales Co.
1972-73: The first electronic bark collars are marketed by Relco and Tri-tronics. 1976 – John Purtell purchases the patent for a radio collar pet containment system from Richard Peck and changes the name of the company to Invisible Fence, building the company up until he sells it in 1993 at about the same time as the patent expires. 1978: Barbara Woodhouse publishes “No Bad Dogs” one of the first popular books on basic dog training. 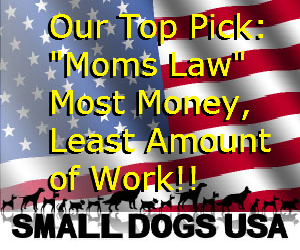 It relies heavily on proper use of a choke chain, and says most “bad dogs” have inexperienced owners who are not training their dogs properly by being consistent, firm and clear. 1984: The U.S. Dept. of Agriculture begins to use beagles to patrol airports for contraband food and other perishable items. 1985: Dolphin trainer Karen Pryor publishes Don't Shoot the Dog: the New Art of Teaching and Training which focuses on timing, positive reinforcements and shaping behavior, and draws heavily on the work of Marian Breland Bailey and Robert Bailey (see 1943 and 1960s). Her book promotes “clicker training” of dogs to improve timing and to allow trainers to communicate and “reward” their dogs from a distance. 1995: The U.S. Dept. of Agriculture begins using Jack Russell Terriers to locate and kill invasive brown tree snakes on the island of Guam. 2000 and beyond: Various cable television shows feature various dog training and rehabilitation methods. The notion that there are “new” and “old” dog training methods obscures the fact that ALL dog training methods involve some form of operant conditioning which is, in fact, pretty old stuff (as old as dogs). None of the dog training shows actually explain the core principles of operant conditioning or their relative worth in different training situations. 2000 – Rapid improvements are made in the the world of e-collars which can now come with tone, vibration, and hundreds of variable levels of electrical stimulation, making them potentially less aversive than old-fashioned flat collars and leashes. The use of old and poorly made collars, combined with poor dog training skills by those who think e-collars are a “quick fix” for any and all problems slows their adoption, as does demonization by “dependency model” and trick-dog trainers. 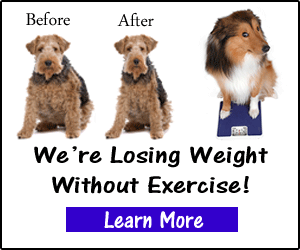 2035 – First robotic dog trainers appear. These machines are the size of an upright vacuum cleaner and are capable of teaching a dog basic obedience (sit, stay, come, heel, go out to place, etc.) as well as simple tricks (roll over, play dead, speak) . These simple robots are little more than BF Skinner teaching machines on wheels, providing diverse food awards and mild electrical stimulations, as well as tone, vibration, and visual cues. Powered by powerful internal batteries and artificial intelligence, they track the location and position of the dog, give human voice commands, and can be programmed to guide a dog through adaptive learning sequences. Infinitely patient, and with perfect timing and consistency, they revolutionize the world of dogs and lead to dramatic declines in canine euthanasia. 2036 – A dog owner was attacked and killed by two small brown and white dogs in her home this afternoon. State surveillance video taken just before the attack showed her trying to switch off the power to her robotic dog trainer, which had been the dogs' only company for the previous month while the owner was on vacation. Dog Training Has a Deep History--What's Next?